Dining at Ridge Assisted Living is nurturing for both the body and mind. It is a staple for the quality of life we provide for all residents. Our residents enjoy three delicious and nutritionally, well balanced meals and a variety of healthy snacks through the day. We are happy to prepare a unique meal for residents with special dietary taste and needs. We select a variety of colorful fruits and veggies, whole grains, and lean proteins to help our residents feel vibrant. A well-balanced diet supports a longer and stronger life, enhanced independence and overall being. Our welcoming dining room provides the perfect environment to nurture friendships while fostering that feeling of home. Connect with other residents over a delightful, home-cooked meal and savor the wonderful atmosphere. During the holiday season our residents indulge in festive seasonal menus that brighten the holiday season. 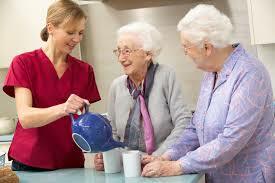 Ridge Assisted Living provides enjoyable meal to meet the unique and nutritional needs of our residents. We utilize a registered dietitian to prepare and oversees our menus to allow us to handle a variety of dietary options which include reduced-fat, low-calorie, high-fiber and low-sodium dishes as prescribed by your physician.